For some, attending next year’s Coachella Valley Music and Arts Festival will be like déjà vu. Organizers announced this morning that the festival, which has been held over three days in past years, will be held over two consecutive weekends in 2012. As in, the same exact musical acts will play sets April 13 – 15 and April 20- 22. The price of three-day passes remains at $269 plus fees. No word yet on who might headline or perform at the festival (the lineup is usually announced mid January) but weekend passes will go on sale for one week beginning this Friday at 10. 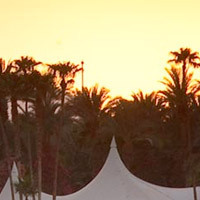 What do you think, is turning Coachella into two separate weekends a great way to handle the crowds that descend upon the Empire Polo Fields each April? Or will this setup diffuse the magic of the event?